Joel Hodgkinson is a Brisbane based Sound Recordist / Mixer, and Post Production Sound Engineer, with over 10 years of professional sound experience. A 2009 graduate of the highly-regarded Music Technology program at the Queensland Conservatorium of Music, Joel has transformed his raw, creative passion for music and film sound into an impressive technical skillset. 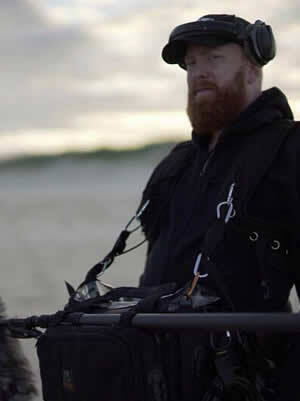 Within the sound industry, Joel has worked as a versatile film sound engineer, both on-set and in post-production, as the project lead on large-scale, high-quality AV and sound installation projects, as the lead sound engineer in studio production projects, as a live sound engineer, and as a tertiary lecturer. In 2011 Joel joined forces with Seth Jackson, a fellow pro-sound engineer, to form Soul Sound Design, a comprehensive sound production service for Film and TV. When they aren’t in their post studio adding their special twist of sonic uniqueness to everything they touch, they can be found individually or as a dynamic duo on location capturing dialogue cleanly and efficiently whilst remaining a pleasure to work with. Joel records sound for any kind of production, from basic ENG, doco and TV to full commercial and documentary work to Long-Form drama. Soul Sound Design’s equipment rigs are adaptable and scalable depending on the size of job. He works in all of South East Queensland (based), Melbourne (2nd base) and wider Australian and International locations wherever there’s work to be done.